The UNM Gateway program is designed for first-time, first-year students from New Mexico who do not immediately meet UNM's freshman admission requirements. If you have received an invitation to the UNM Gateway Program, we encourage you to take advantage of this opportunity to pursue your degree at UNM. The Gateway Program is a cooperative program with our neighboring community college partners and UNM branch campuses designed to ensure a participating student's success in college. Only New Mexico residents applying for admission as first-time, first-year students to UNM may be invited to participate in the Gateway Program. Students must complete 24 transferable credit hours of core curriculum at a partner campus within two years of your admission to the Gateway Program. Once students begin the transfer process to UNM (which includes submitting a current college transcript and Gateway Transition Form), they are guaranteed admission and do not have to reapply. Please note that participating in the Gateway Program does not guarantee admission to limited access majors. We want you to achieve your dream and we are committed to ensuring your success. 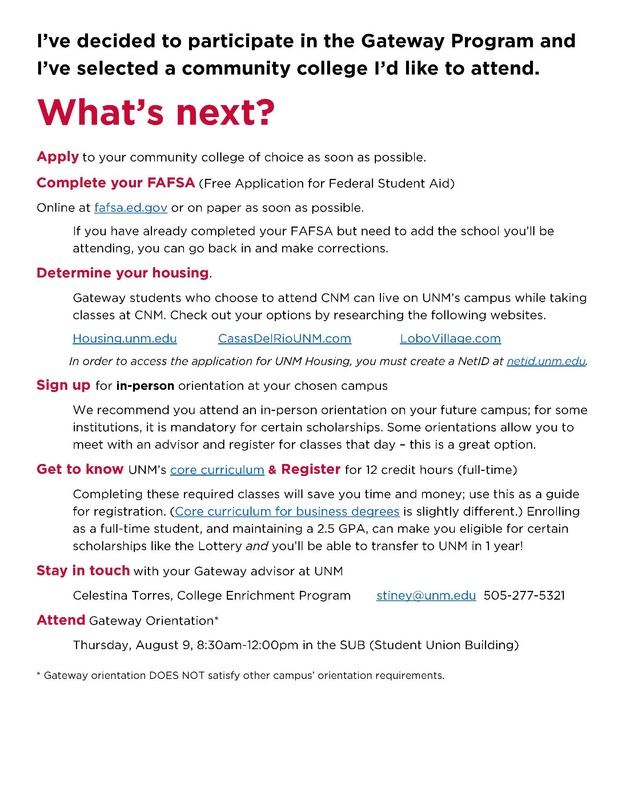 Call 505-277-5321 or email Celestina Torres or Leslie Armell with questions about UNM Gateway Program. Are you ready to transfer to UNM? Are you academically ready and have a minimum 24 transferable credit hours and a 2.0 GPA? If so, you may be able to begin your transfer! To begin the transfer process you will need to complete the Gateway Program Transition Form and submit your official transcript from the community college you are attending. Are you transferring to UNM with the New Mexico Legislative Scholarship? If so, please contact the UNM Scholarship Office for further instructions on how to transfer the scholarship. Contact Celestina Torres to start the transfer process. Need to see an Advisor? Stop by the College Enrichment Program. Hourly parking is available at the Cornell Garage, and at individual pay stations around campus at $1.00 per half-hour. All hourly parking is purchased using pay stations that accept VISA, Mastercard, and Discover. Cash is only available on the third floor of the Cornell Garage. After parking, please make your way over to Mesa Vista Hall just North of the parking garage.